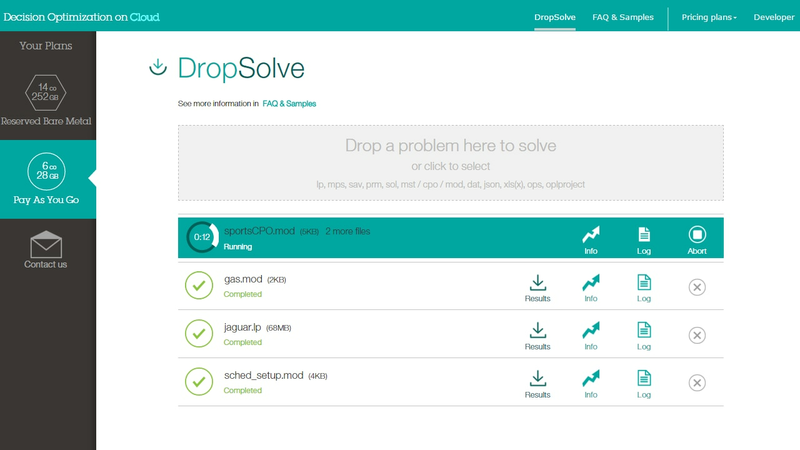 Explore what-if decision making using the DropSolve interface. Develop and deploy optimization models and engines for planning and scheduling solution in many business applications. Read how IBM helps you use prescriptive analytics in the cloud to optimize decision making. Learn how to create a project and solve an optimization model. Build and run models in several APIs. This tutorial showcases the Python API and the constraint programming (CP) engine. View tutorials on how to launch IBM CPLEX Studio, create a project, enter an OPL model and create run configurations.